The Standard and King sham have a flax stripe in the center of the sham. The Euro sham is only offered in solid OYSTER color and does NOT have the stripe pattern in the center. 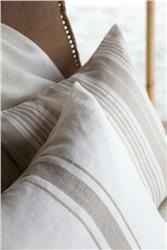 Combine these shams with the bedding of Heritage organic linen, Sahara bedding and with the matching coverlet. Select Bedding Size euro - 25"x25" Standard (SH) - 20"x30" King (SH) - 21"x37"
King sham 21" x 37"